I believe life is revelatory. We can walk around dazed and trying to fast forward, just coping with the best head and heart we can summon. I will be showering or walking or daydreaming and then, bam, there it is, distilled. As mothers and fathers who are deeply enamored with their children, we are always writing stories along the way, always on the hunt for songs to put on the mix tapes of our lives. We know how weak we can feel, racing along with forever, how vulnerable the dance is, how muscle memory is powerful but fails us when the world shifts and falls away under our feet. So we give the memories form, we shape them, we wait and watch for the moment our feelings align with the light. We take pictures to remember the feeling of a life that is full and waning. Our lives deserve art and evidence. And I take it any way it comes. It is not the camera but the eye, the history, that single, pure rectangle in which you show the whole world. Sometimes, phone pictures can be dismissed, both in conception and reception. They aren't real, "I wish I had had my big camera", we can all recognize this, or hear it often. But I think of them as freedom and truth - so much less to calculate, technically though not qualitatively. My phone is maybe the most honest of my cameras, with which I shoot from the hip and heart. I can take risks with it, I can run and get it wet and sandy, I can allow myself to be surprised, to accept mistakes as gifts, to watch all the fancy rules I know change. In this picture I see the fog and inversion of my love drenched eyes and recollection. I see the long shadows my kids cast against the parts of me that were before they were. I see a gap in age that will become an animal of its own soon. I see the thin control I still have to frame it as I need to frame it, with aching, longing, myopic vision. I see magic, I remember it, walking a few steps ahead, seeing them see the ocean, summer against our sticky skin, happy, together, trying. My daughter always says, "I wish our eyes could be our cameras." Because all cameras fall short, they capture one dimension, we put them down freely and often, we just need to BE the picture, to forget ourselves in our actual lives, in theirs. But when we do have one, in that beginning of a second that we pick up our phones, I think it best to remember all the seeing we do without them. It will show in the pulse of those pictures. We might feel it as our own. 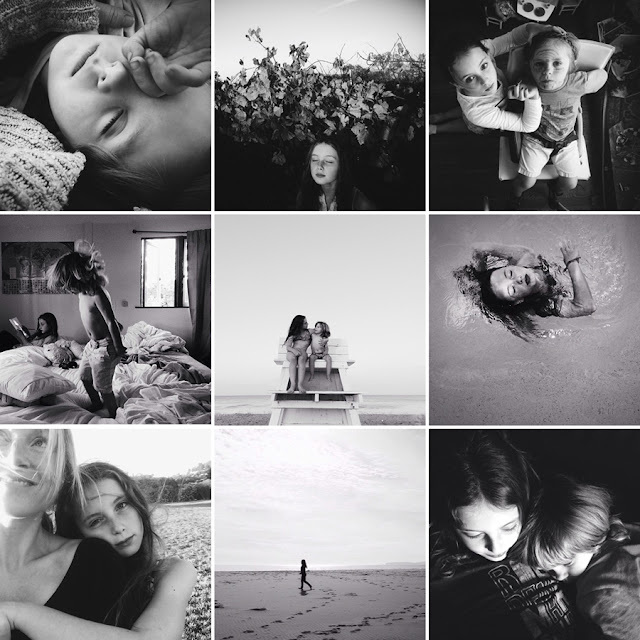 You can view more of Amy Grace's iphone photography at her instagram feed @_amy_grace and more of her thoughts on life and motherhood at Motherhood With A Camera.